This week's our final challenge in the series of a Lunch Less Ordinary. I can't believe we are at the end already! It seems like only yesterday we were starting out! It's been absolutely huge FUN and if you've been following our blog, you'll know we've been helping show you how fun lunch can be! 2) Inspired by one of our Facebook fans -take £5 for the week to buy the essentials and we’ll send the wraps and you must complete the Storecupboard challenge – using up whatever you’ve got left in the cupboards, fridge and freezer to make your meals for the week. Now I did consider the frugal challenge, and hurried off to the supermarket to investigate whether I could do it. But then to create a week's worth of FUN and inspiring lunches out of that budget was a huge challenge, with just £5 to spend on ingredients! So we thought again. 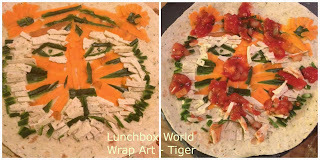 Last week, we are absolutely thrilled to report that we won the top prize with our food art wraps!! In case you missed them, it's the 7 countries in 7 days and we also entered our food art inspired by our favourite movies! and then she turned it into a pizza and promptly ate it.. It did take 90 minutes to create and did make her hungry! Luckily I took the photos before it all disappeared! 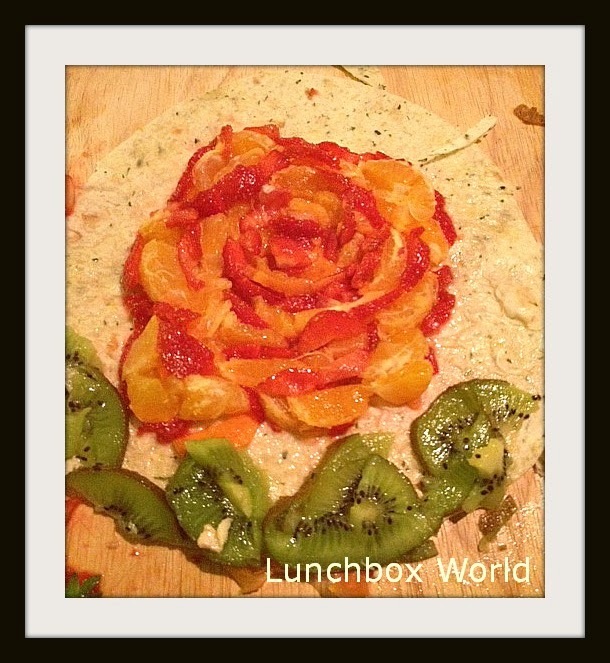 Not satisfied with creating one wrap, she went on to create a sweet dessert, an even more complicated creation, a rose, flower wrap, made out of strawberries, satsuma segments and kiwi for the leaves! Another 80 minutes later, she then promptly squirted cream on this, rolled it up into her sweet wrap, and ate that!! Meanwhile, whilst on a trip to London this week, I was off on a mission trying to see if I could come up with some place names that could be added to the #wrapmap, exploring all the streets of London and finding place names linked with food. First up I have Ham - West Ham on the tube map. 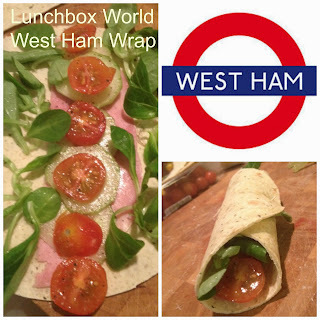 So I cleverly made up a mini wrap with honey roast ham, cherry tomatoes, cucumber slices, lambs lettuce, and a smattering of green pesto... Let us know what you think if you try it! 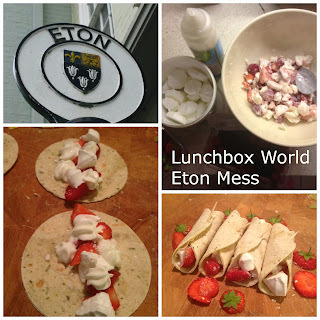 Then for dessert, whilst in Windsor back on Week 2's mission, we also visited Eton. (It's just separated from Windsor by the Thames, so I crossed the bridge over into Eton). Eton Mess is our tasty dessert wrap, made of raspberries, strawberries, squirty cream (something we always have in our fridge, ready to top that hot cocoa!) and crushed meringues. All wrapped up in these cute little wraps I cut out with a cutter, held together with a cocktail stick. Now this mini meal wouldn't be complete without some cheese and biscuits with a cup of coffee... And passing through Gloucester Place on the way back to Marylebone station, I came up with the idea of Double Gloucester cheese with chives and onion that I had in the fridge. If you haven't tried this cheese, it's rather delicious. 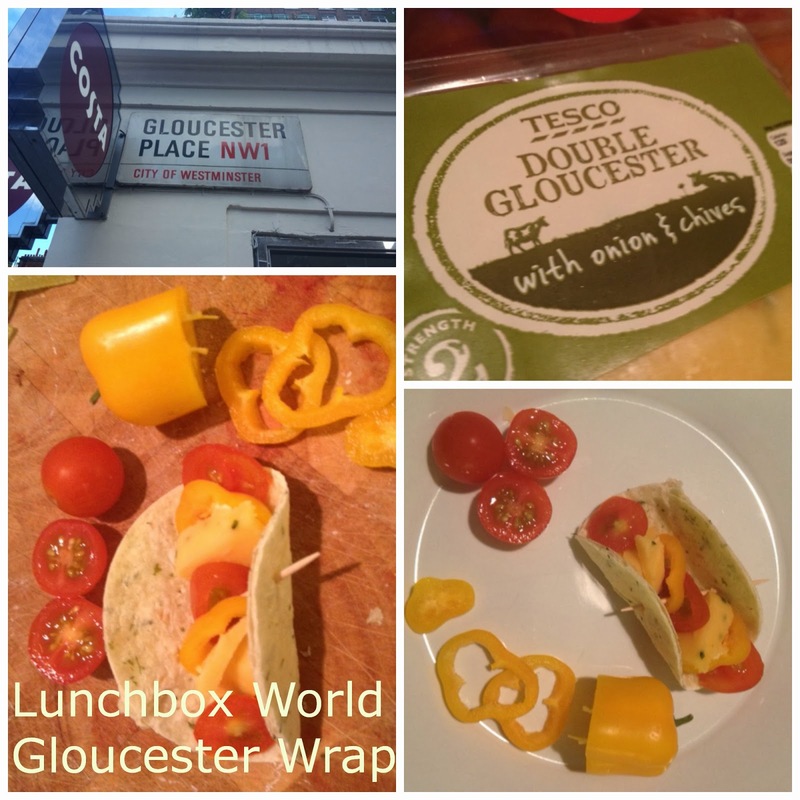 This mini wrap creation includes double gloucester cheese, fine slices of mini yellow pepper and cherry tomatoes finely sliced. If you want to add some extra crunch, celery is always fun! And finally, as it's Halloween, we just couldn't resist putting together a mini Halloween party spread! So we got out the Halloween cutters and, using the wraps, the salsa sauce for the base, some cheese sprinkled on top, we created some mini pumpkin pizzas. 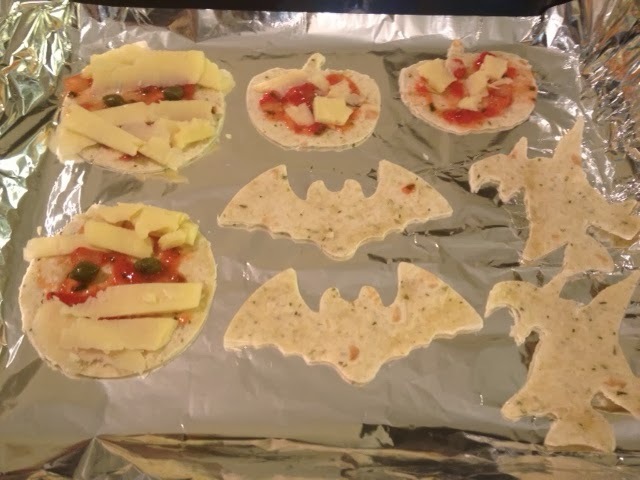 Then for the mini mummy pizza wraps, we made the same pizza with the salsa sauce for the base, topped with slices of cheese, that looked like bandages, and used two capers for the eyes. You could equally use olives, or peas, or sweetcorn, whatever you have in your cupboard! 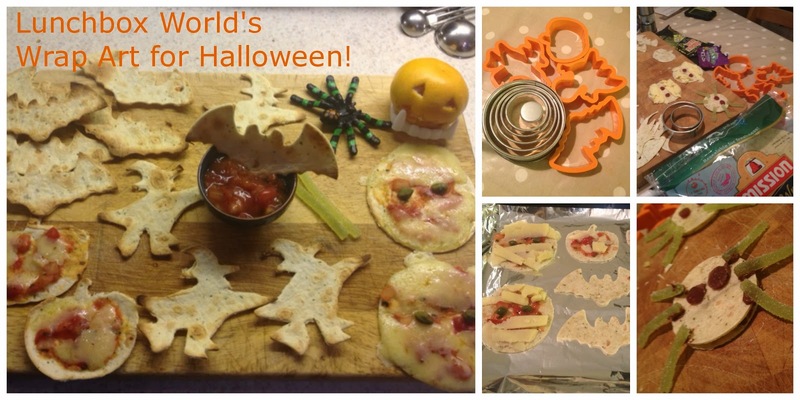 Mini wrap pizzas for Halloween! 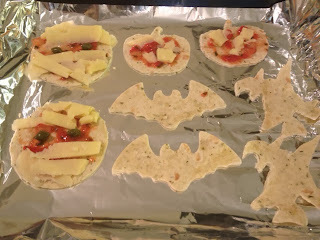 We then cut out some Halloween shapes: the bats, the witches, and toasted them briefly under a medium grill. Then laid them all on the board, all ready to dip into the salsa sauce. Then for a sweet treat, we made these simple spiders, using a small smooth round cookie cutter, cut two circles, spread one with some nutella, and sandwich together. Then with some stringy sour sweets, we created the legs, or even licorice laces, basically, use anything that look like spider's legs and then add two little eyes that could be currants, milk chocolate buttons or raisins. Whatever you have. We used frootz (a new blackcurrant fruit snack from Whitworths). With cutters, you can simply toast the wraps into Halloween shapes! 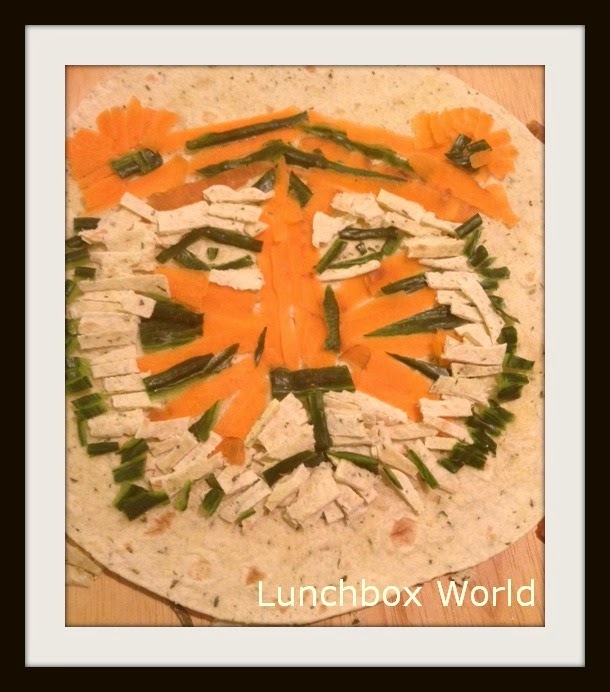 We hope we have inspired you to have a go and try some of these simple ideas to create some lunchtime FUN with food, and a lunch a little less ordinary - with just a few ingredients! If you want to join in the FUN and fancy entering the competition for your chance to win £10,000 cash or an amazing experience around the world, visit the Mission Wraps UK facebook page. That's where they'll be posting the winners of this competition too! So which is your favourite lunch less ordinary idea? Which will you try? Disclosure: All opinions and ideas are our own. This is our entry to the Lunch Less Ordinary competition in week 4. We have been sent some wraps to help us complete these challenges and we are in the running to win some great prizes. In case you've missed our other entries in the competition so far, here are all the links so you can go and catch up! or re-visit if you've seen them before!